Alleluia, Christ is risen! Christ is risen indeed, alleluia! Ahhhh, the words of Easter, the proclamation of resurrection, the sweet relief from the dark days of Lent. Christian churches fill up on Easter Sunday and right then and there, the very first thing, we show our hand. “Christ is risen indeed, alleluia!” These are party words. Celebration words. And do we ever revel in this celebration. Trumpets, lilies, singing, smiles, Easter Eggs – these are symbols of the celebration. And we keep right on partying for 50 days as the season of Easter unfolds. And so we should. This is the biggest and best of the good news – God coming in flesh, in the person of Jesus, dying and rising to new life, and saying to Death, “Your services are no longer needed.” For Christians, it truly doesn’t get any better…or any more scandalous. Make no mistake, it is a scandal. Through sealed stone and an armed guard, all meant to protect death inside a tomb, life emerged. Not just any life but the life of the One and from the One who brings all things to life. If death is no longer a given, no longer secured in a sealed tomb, then what kind of life are we talking about? What kind of life are we celebrating these 50 days? This is a fair and honest question. Peter preaches to this question of life eschatologically, that life for the Christian is “revealed in the last time.” He reassures exiled people that their suffering will end even though they suffer right now. Peter’s words are a blessed assurance in a painful time. A few years ago I was leading a Bible study out at New Beginnings Church in the Denver Women’s Correctional Facility. The topic of life after death, eternal life, came up as a philosophical question – a question we wrestled with intellectually and thoughtfully. The conversation moved along as these conversations often do, with a lot of opinions thrown around and some curiosity sprinkled in for good measure. When from the back of the group of about 100 women, one of them chimes in with a lot of anger. Her words ring in my ears today. She said, “I don’t know what you all are talking about but I believe God has a place for me where crying and dying are no more…I’m counting on it!” She preached as powerfully from her own moment as Peter preaches from his. We even get in on their preaching when we join our voices with theirs as we speak to the “life everlasting” in the Apostle’s Creed. This is the Easter promise as deliverance. This is resurrection from something – from this life that can include the unbearable. As a relevant aside, some of you may know how much some Christians delight in prepositions. Those small words of grammar tucked in front of a noun to help us write about things in location to other things. For example, Lutheran Christians will say that Jesus is “in, with, and under” the communion bread and wine. The theological battles waged over these little words of location are stunning. Nonetheless, prepositions have their helpful place. As in the Easter promise of eternal deliverance from this life once having passed through death. But this week, Thomas makes me curious about resurrection in this life. “In” being the operating preposition, the key word. Thomas and the disciples have locked themselves in a room in Jerusalem. The metallic taste of terror still on their tongues after Jesus’ crucifixion. Terror that includes their own inability to prevent Jesus’ death or be present for it. A week before this moment in the locked room, Thomas missed out on seeing the risen Jesus with the other disciples. But Jesus shows up, wounds and all, and Thomas’ mind and faith are put at ease as he puts his fingers in the hand and side wounds of Jesus. Which, by the way, gross! Most of us can’t stomach a small wound that needs stitches much less a stab-wound created by a spear or a nail-hole through a hand. And there’s Thomas, poking and prodding in the wounds of Jesus like he’s on an Easter egg hunt. 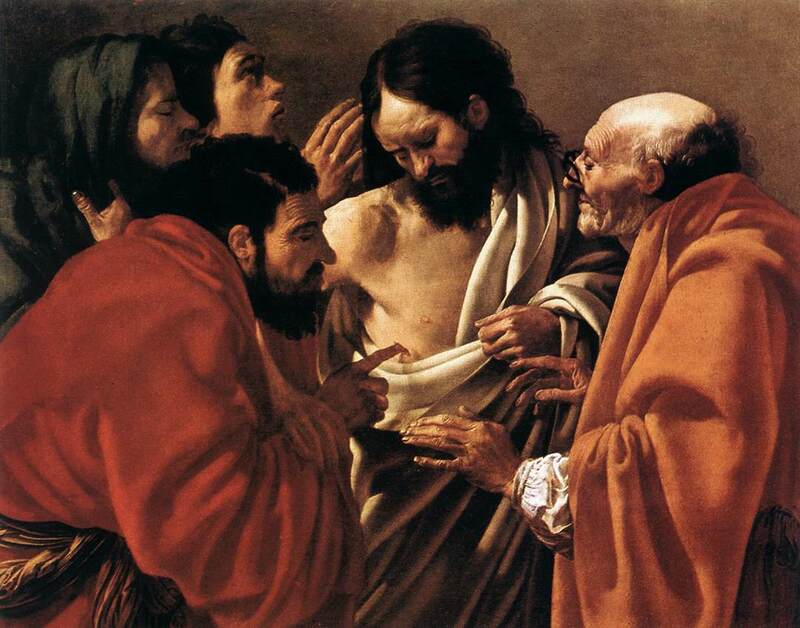 To what end is Thomas physically examining Jesus? More importantly, why is Jesus subjecting himself to this exam? The end-point is not deliverance from the locked room or from eventual death. Thomas goes on to die a martyr after all is said and done. This is the resurrection of Christ, wounds and all, playing out in the locked room with Thomas and the other disciples – resurrection in, not from. A good friend of mine has been listed in our ongoing prayer requests for some weeks now. Her name is Chris. She gave me permission to tell you her story. Chris and I go back a ways. The kind of friendship that includes talking about our families and our lives within the context of our faith. In part because of this soul-searching and Christ-searching, Chris formally presented me during my ordination. She and I continue to talk faith, life, and Bible with seamless fluidity. A year older than me, six months ago Chris was living daily life with the usual mix of highs and lows and good health. On November 5th, her hands started to hurt during the night. From that first symptom we fast forward to today. She now has muscle weakness that makes it difficult to walk up stairs, empty a dishwasher, and swallow. Looking more and more to her doctors like some kind of autoimmune inflammation in her muscles, she and I spoke at length this past Monday night. There are many of us or people we love dealing with situations in life along the lines of Chris or Thomas. During Easter we celebrate Christ’s resurrection as life everlasting even as we celebrate Christ’s resurrection in our lives now. Christ now breathes the Holy Spirit on you, sharing his peace. Christ’s resurrection, wounds and all, is in this life for you. Alleluia, Christ is risen! Christ is risen indeed, alleluia! 11You show me the path of life. 1 Peter 1:3-9 Blessed be the God and Father of our Lord Jesus Christ! By his great mercy he has given us a new birth into a living hope through the resurrection of Jesus Christ from the dead, 4and into an inheritance that is imperishable, undefiled, and unfading, kept in heaven for you, 5who are being protected by the power of God through faith for a salvation ready to be revealed in the last time.6In this you rejoice, even if now for a little while you have had to suffer various trials, 7so that the genuineness of your faith — being more precious than gold that, though perishable, is tested by fire — may be found to result in praise and glory and honor when Jesus Christ is revealed. 8Although you have not seen him, you love him; and even though you do not see him now, you believe in him and rejoice with an indescribable and glorious joy, 9for you are receiving the outcome of your faith, the salvation of your souls. Here we are beginning what’s been come to be called the Three Days. Lent is drawing to close and inasmuch as Lent is a deepening, the Three Days begins with this evening of Maundy Thursday and takes us deeper yet. There are many people who don’t take the Lenten elevator down to these levels. They become darker and more confusing. We start with the Exodus story of Passover. The Hebrews are gearing up to leave Egypt, their home and their enslavement going back hundreds of years. They have to pack fast and be ready to move fast. Pharaoh will not be happy. It’s probably safe to say that he and many other Egyptians will grieve deeply well beyond the Hebrews departure. After all, the slaves will be gone and their first born boys will be dead. The Hebrew people take the unleavened bread, the fast-food of their time, and get out of Egypt with nothing but turmoil behind them; turmoil that will close in fast on their heels as they head out into exile. This time of disorientation, this time of freedom, is then to be remembered for all time. The last verse of the reading today says, “This day shall be a day of remembrance for you. You shall celebrate it as a festival to the Lord; throughout your generations you shall observe it as a perpetual ordinance.” In the ensuing centuries, Jewish people all over the world remember God’s act of freeing their ancestors from slavery in the celebration of Passover. The time of confusion organized into a ritual of remembrance. Remembering what God has done, leaving the door open for what God will do next. From the Exodus we fast-forward to the first century. Jesus is in a room with some friends…and an enemy. And Jesus does something startling. He takes off his robe and puts a towel around his waist. These actions of disrobing and girding are the not-so-subtle movements of a warrior preparing for battle. But then Jesus takes a knee in a position of surrender. He begins to wash feet in a way that no ordinary host, and certainly no warrior, ever would. This is, after all, a dirty task ordinarily taken on by the slaves of the household. Interesting, isn’t it? That we just talked about freedom from slavery and here Jesus is willingly taking on the work of a slave. Note that everyone gets their feet washed. Everyone gets clean feet including Judas. 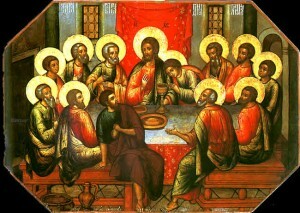 Judas who will end up betraying Jesus not too much later in the story and Peter who will deny that he ever knew Jesus. The same Peter who does not want Jesus doing the work of a slave by washing his feet suddenly becomes the Peter who wants Jesus to wash his whole body. Peter is insistent in two different directions. Peter seems to be trying to figure out this latest twist in the action and how to respond. His effort to keep up with Jesus’ meaning leaves his head spinning and, once again, has him saying things that make no sense. Although we can’t blame him really – Jesus takes first prize for saying confusing things. Just before the story of Jesus washing the feet of the disciples, he makes a speech to his disciples that includes him saying, “Whoever believes in me believes not in me but in him who sent me. And whoever sees me sees him who sent me. I have come as light into the world, so that everyone who believes in me should not remain in the darkness.” Jesus washing the feet of his disciples gives us a hint of what this light in the darkness looks like, what God in the world looks like. Like a warrior, girded for battle, who takes a knee in surrender and empties himself for those around him. From there, Jesus says, “I give you a new commandment, that you love one another. Just as I have loved you, you also should love one another.” And with this, the disciples’ confusion hits a new level. Jesus’ command, his mandatum from which we get the term Maundy Thursday, precedes his death on the cross but includes his death on the cross. The mystery of what Jesus is doing during the foot-washing and what Jesus will do on the cross is utterly confusing to everyone involved. This may partly explain why many people don’t take the Lenten elevator down to these levels. After all, how are we to engage in the mystery of these Three Days that begin with a foot-washing and end in a tomb? The short answer is that we don’t. We don’t engage the mystery. The mystery engages us. At Christ’s command, he organizes our confusion into a ritual of remembrance. “Do this in remembrance of me,” he says. But it is not only ritual and it is not only memory. 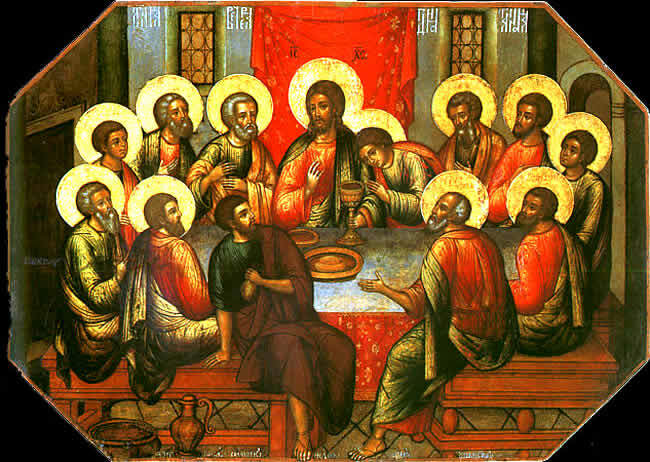 Christ is untamed by the tidiness of the table and the reverence with which we approach him. This is Jesus after all – in bread and wine given and shed for you. In this meal, the self-sacrificing love of God is poured out and through us with the fierceness of a warrior poured out in surrender – drawing us deeper into the mystery of the cross and claiming us in God’s name. Exodus 12:1-14 The LORD said to Moses and Aaron in the land of Egypt: 2This month shall mark for you the beginning of months; it shall be the first month of the year for you. 3Tell the whole congregation of Israel that on the tenth of this month they are to take a lamb for each family, a lamb for each household. 4If a household is too small for a whole lamb, it shall join its closest neighbor in obtaining one; the lamb shall be divided in proportion to the number of people who eat of it. 5Your lamb shall be without blemish, a year-old male; you may take it from the sheep or from the goats. 6You shall keep it until the fourteenth day of this month; then the whole assembled congregation of Israel shall slaughter it at twilight. 7They shall take some of the blood and put it on the two doorposts and the lintel of the houses in which they eat it. 8They shall eat the lamb that same night; they shall eat it roasted over the fire with unleavened bread and bitter herbs. 9Do not eat any of it raw or boiled in water, but roasted over the fire, with its head, legs, and inner organs. 10You shall let none of it remain until the morning; anything that remains until the morning you shall burn. 11This is how you shall eat it: your loins girded, your sandals on your feet, and your staff in your hand; and you shall eat it hurriedly. It is the passover of the LORD. 12For I will pass through the land of Egypt that night, and I will strike down every firstborn in the land of Egypt, both human beings and animals; on all the gods of Egypt I will execute judgments: I am the LORD. 13The blood shall be a sign for you on the houses where you live: when I see the blood, I will pass over you, and no plague shall destroy you when I strike the land of Egypt. Craig R. Koester, Professor of New Testament at Luther Seminary, lecture content from the course: Gospel and Epistles of John in Fall Semester 2010. 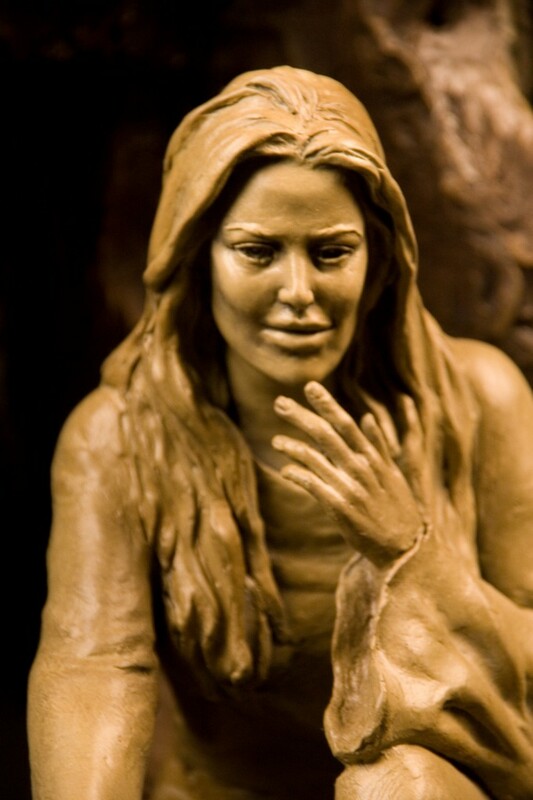 John 11:1-45 Now a certain man was ill, Lazarus of Bethany, the village of Mary and her sister Martha. 2Mary was the one who anointed the Lord with perfume and wiped his feet with her hair; her brother Lazarus was ill. 3So the sisters sent a message to Jesus, “Lord, he whom you love is ill.” 4But when Jesus heard it, he said, “This illness does not lead to death; rather it is for God’s glory, so that the Son of God may be glorified through it.” 5Accordingly, though Jesus loved Martha and her sister and Lazarus, 6after having heard that Lazarus was ill, he stayed two days longer in the place where he was. Some of us know what it’s like to watch someone’s life leave their body through an illness. Mary and Martha certainly do. There is enough time after Lazarus became ill to send word to Jesus. There is more time after the sisters sent word and even more before Jesus arrived after Lazarus died. Some of us know how long those days, hours, and minutes can seem while we wait to see what will happen. Will the outcome be life? Will it be death? We know the fear and the despair as we wait and as we watch…as we lose. We develop tomb-vision as we try to look everywhere but toward the downward spiral of life on which our loved one is attached. We try, but we cannot keep from seeing the tomb edge closer and closer. The prophet Ezekiel knows this despair too. In the early 500s B.C.E., Ezekiel became part of the first deportation of the Southern Tribes of Israel at the hands of the Babylonians. They were taken into exile to ancient Babylon, located in what is now modern day Iraq. The Northern tribes of Israel were long gone, taken by the conquering Assyrian armies in the late 700s B.C.E.. Everyone knew that the temple in Jerusalem was God’s dwelling place. Everybody knew. And yet Ezekiel and the Southern Tribes ended up far, far away in a land where their God was not known. From this reality, comes the lament of the people in verse 11, “Our bones are dried up, and our hope is lost; we are cut off completely.” After all, their cousins in the Northern Tribes had disappeared just a hundred or so years before. It was in the realm of possibility. These people can’t even pretend to look anywhere but the tomb that edges closer and closer. Their tomb-vision is sharply honed; with death seemingly inevitable they make the leap that God certainly doesn’t seem to be anywhere in sight…in this valley of the dry bones. Mary, Martha, and Ezekiel are not the only ones with tomb-vision. Variations on tomb-vision connect natural disasters, or illness, or accidents to the absence of God…or, even worse, attributing these events to the intentional hand of God. The temptation is to deny God’s presence in times of despair and presume God’s presence when things go well. Many, many of us actively worry about where God is and where God isn’t. We add this to some additional worry about what’s going to happen to the people we presume that God has abandoned because of certain actions. Presuming God’s absence in this way is antithetical to the crescendo of the cross and the silence of the tomb that we are edging toward as Palm Sunday and Holy Week loom on the calendar a week from today. We are treated to whispers of Holy Week in the first few verses of the John reading today. Mary’s anointing of Jesus’ feet is remembered to us even though we don’t actually get to that part of the story until the beginning of the next chapter. Anointing is done for divine kings and for the dead. Jesus’ anointing conflates the two. In verse 25, using yet one more divine “I am” saying, Jesus claims to be the resurrection. In verses 4 and 40 Jesus talks about God’s glory in conjunction with the Son of God being glorified. When the word “glory” is used in the Gospel of John, it is code for Jesus hanging on the cross. We tend to think all kinds of things when we hear the word “glory” but hanging on a cross is not typically one of them. Years ago, I had a strong aversion to Holy Week. I just wanted to go from the Transfiguration straight to Easter. After all, Lent is quiet and grey culminating in Holy Week that is dark and gloomy and ends in a tomb. It runs smack up against the addiction to optimism, smack up against our desperation not to look at the ever-so-obvious tomb. But these days, as I look forward to sinking into the depths of Holy Week, focusing on cross and tomb simply feels like freedom. It feels like freedom because it feels true. There is pain in the world and human beings are the cause of much of it. Since I include myself in the ‘human beings’ category, the relief of Holy Week is enormous. Facing this truth head-on, using the clarity of tomb-vision that neither looks away nor blocks out God in the midst of it, reveals what Jesus does when confronted with a tomb. In the tomb of Lazarus, lays a man who’s about to walk again. Jesus tells him to come out. Lazarus comes out. His disorientation must be staggering. Jesus looks at the people and says, “Unbind him.” They are participants in Lazarus’ moment. Among the people who unbind Lazarus are surely many who participate in Jesus’ crucifixion. A lot of us might be able to relate – after all, how many of us participate in a moment of new life only to turn around and call for a crucifixion of one sort or another? Raising Lazarus is Jesus’ final sign – at the same time declaring his divinity and inciting his execution. On Palm and Passion Sunday, Maundy Thursday, and Good Friday we are confronted by Jesus’ passion, all the events that lead to Jesus hanging on the cross and dead in a tomb. It is a week during which we can relate to those people at Lazarus’ tomb who unbind a man into life one moment, and march off to court to call for the execution of another man in the next moment. The people are ready to crucify because the fear that the one who brings life might get noticed by the powers that be in Rome and bring death to them all. So as Holy Week whispers to us from the faraway place of next week, we pause with the crowd of people who unbind Lazarus. We, like them, wonder about the power that can resurrect. The power that can draw unwanted attention. Lazarus isn’t the only one standing there dazed and disoriented, afraid. O my people, o my church, what more could I have done for you? Answer me. I lifted you up to the heights, but you lifted me high on a cross. but you have prepared a cross for your Savior. And as we the people acknowledge the mercy of God our tomb-vision gets clearer still. We see the fullness of life that God pours through us in the face of our fear. We see what is already there; our asking merely unveils what is already there. We see the Christ, Word made flesh. We see Jesus’ self-sacrifice on the cross simultaneously revealing the breadth of divine power poured out to reveal the depth of divine love. We see each other receiving the Spirit who breathes life into our bodies – here, now, today, with these people whom Jesus calls to help unbind us as we are called into resurrected life. Personal conversation, April 2, 2014, Nadia Bolz-Weber reminded of her friend “Sara’s” question about this Lazarus story.